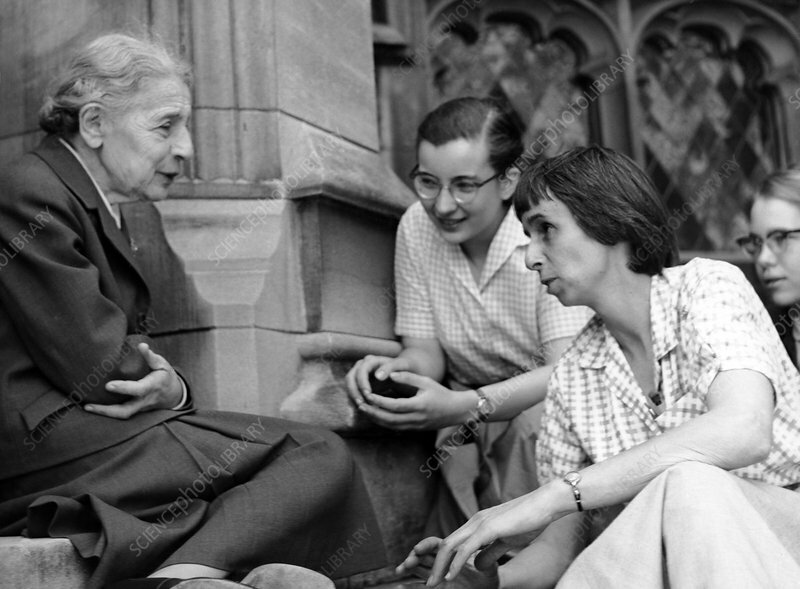 Lise Meitner with students. German chemist Lise Meitner (left, 1878-1968) was a pioneer of nuclear chemistry. She worked with Otto Hahn in the 1930s on uranium bombarded with neutrons, but they did not realise fission was occurring. In 1938, Meitner (who was Jewish) fled Nazi Germany to Sweden. By 1939, both Hahn and Meitner had worked out that nuclear fission was taking place. This led to the building of the first atomic bomb. Hahn, but not Meitner, received the 1944 Nobel Prize for Chemistry. Photographed in April 1959, at Bryn Mawr College, Pennsylvania, USA.